LONDON – Voting will begin today to decide if veteran leftist Jeremy Corbyn will remain leader of Britain’s Labour party, with an ill-tempered campaign deepening divisions that threaten the party’s future. Ballots and online voting forms were due to be sent to party members, who will have until September 21 to decide whether to replace Corbyn with MP Owen Smith, previously little known outside Westminster. The 46-year-old triggered the election by declaring his candidacy last month, warning that Corbyn’s leadership was making the possibility of a split in the party "dangerously real". Smith, a former member of Corbyn’s top team, is also targeting voters to the left of the party, promising a "socialist revolution". "Not some misty-eyed, romantic notion of a revolution where we are going to overthrow capitalism and return to a socialist nirvana... but a cold-eyed, practical socialist revolution where we build a better Britain," he said last month. Corbyn, 67, is favourite to stay as leader, retaining the support of most trade unions and many who signed up last year to propel him to a shock win in the leadership election called following the party’s thrashing in the general election. But he has failed to win over many of the party’s MPs, 80 percent of whom backed a recent vote of no-confidence in their leader. 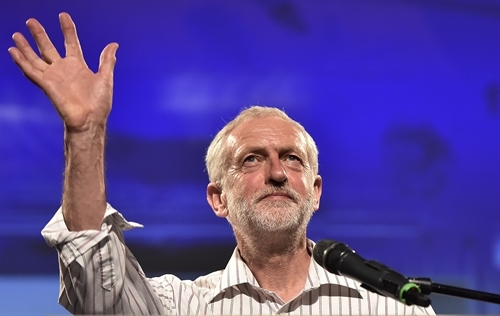 Britain’s vote on June 23 to leave the European Union provided the catalyst for the leadership challenge, with many in the party criticising Corbyn’s performance during the campaign. At a recent debate, Smith accused the veteran socialist of "sloganising" rather than holding the Conservative Party to account, and of failing to campaign hard enough to prevent a vote to leave the EU. Loud boos, cheers and heckling have characterised many of the debates between the two men while local party meetings have been suspended during the contest due to allegations of intimidation levelled against Corbyn’s supporters, exposing the party’s growing rift. Some commentators have warned the outcome could even split the party, which grew out of Britain’s trade union movement in the 19th century. Corbyn has the support of many Labour members, and since February 2015 party membership has surged from 200,000 to 540,000. He is also backed by Momentum, a mass movement of party members who have turned out in their droves to support him at events around the country in recent days. However, he received a setback earlier this month when a court ruled that 130,000 new party members who joined in the six months up to July 12 could not vote in the leadership contest. Labour’s London Mayor Sadiq Khan also delivered a blow on Sunday by declaring his support for Smith. "Jeremy’s personal ratings are the worst of any opposition leader on record and the Labour party is suffering badly as a result," Khan wrote in the Observer, the Sunday version of the centre-left Guardian newspaper. "Jeremy has already proved that he is unable to organise an effective team and has failed to win the trust and respect of the British people," he added. Smith appears to be targeting pacifist Corbyn’s grassroots base, causing controversy by calling for the British government to "get round the table" with the Islamic State group.